The combination of a few flavorful ingredients result in a tangy, hearty dip that will have your guests begging for more. 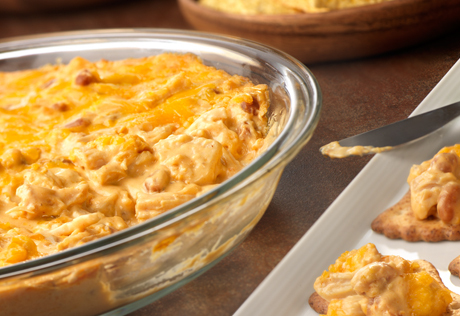 Serve it with fresh veggies and crackers and watch how fast it disappears! Heat the oven to 350°F. Stir the chicken, pork and beans, cream cheese, half the Cheddar cheese and the BBQ sauce in a medium bowl. Spoon the chicken mixture into a 9-inch pie plate. Bake for 25 minutes or until the chicken mixture is hot and bubbling. Sprinkle with the remaining cheese. Bake for 5 minutes or until the cheese is melted. Serve with fresh vegetables and/or crackers for dipping.